Mauritius host Mauritania on Sunday looking to overturn a one goal deficit in the second leg of their Africa Cup of Nations preliminary round qualifier. Kevin Bru has been released by his Bulgarian club Levski Sofia, while locally-based Fabrice Pithia and 38-year-old Jimmy Cundasamy, who plays in Reunion have all been called up. "We aim to put the Mauritanians on the wrong foot right from the start," Patel told BBC Sport. "I have a feeling Kersley Appou will send us through as he is a prolific scorer." The Mauritanians have been boosted by the arrival of the Zamalek forward Dominique Da Silva, who missed the first leg because he had to play for his Egyptian club. Mauritania midfielder Adama Ba (pictured), who scored the only goal of the first leg, is equally confident of victory. 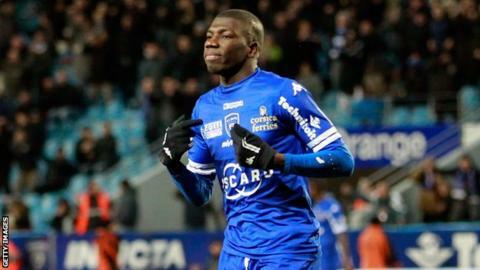 "It was a goal that made us at ease but we could have scored at least three goals," the SC Bastia player told BBC Sport. "Now we need to do everything to qualify as we want to be present in the group stage." His team-mate Ahmed Ahmedou, who plays in England, says the best form of defence for his side will be to attack and try and extend their lead. The overall winner will go into next Sunday's draw for the next round of preliminary qualifiers. They will join 27 nations in the draw for the next stage which will be played next month.